Lovely ladies of AKA - take a look at all the choices we have for you here. You'll see why Pretty Girls shop with us! 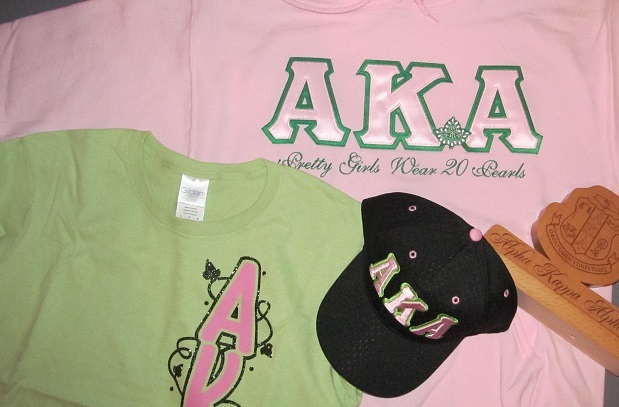 Buyer acknowledges and agrees that he/she is purchasing paraphernalia and other goods (collectively “Goods”) that bears Alpha Kappa Alpha Sorority, Inc. (“Sorority”) logos, designs, copyrights and trademarks for a member of the Sorority. Buyer understands and agrees that a non-member is not supposed to purchase, own or possess such items except I may purchase such items for the benefit of an active member, and as a condition to being allowed to purchase such Goods, he/she agrees that Sorority retains all rights and ownership in the underlying Goods that bear Sorority logos, copyrights and trademarks. Thus, such Goods may not be resold by Buyer directly or indirectly; on-line via a third-party (including but not limited to ebay.com, amazon.com, etsy.com, pinterest, etc…) or by any other means. Any attempt to do so will result in the forfeiture of the Buyer’s right to possess the Goods; the immediate vesting of the Sorority right to possess the Goods; and acknowledgement to third party(ies) that the Sorority has the immediate right to remove such items bearing the Sorority Marks and the subsequent surrender of the Goods to the Sorority.